Again, A Time Machine reappears at Edinburgh Printmakers, with the presentation of Make the Living Look Dead, The Wanderer (The Storage) by Laure Prouvost and A Poster Project by Jonathan Monk. For Make the Living Look Dead, a selection of artists that we have worked with over the years were invited to make a new work on A4 paper as a contribution, intervention or fictionalisation for our archive. Each work plays with notions of time, and exposes the fragility of coherence inherent in the archive. Contributions range from original discarded material to found objects or fictionalised letters, as well as new work masquerading as past proposals or future projections of sequels, panegyrics or unfinished work. Particpating artists are: An Endless Supply, Steve Beard and Victoria Halford, Pavel Büchler, Martin John Callanan, Brian Catling, Adam Chodzko, Jeremy Deller, Mark Dion, Giles Eldridge, Ruth Ewan, Luca Frei, Dora García, Beatrice Gibson and Will Holder, Liam Gillick, Susan Hiller, Karl Holmqvist, Stewart Home, Hanne Lippard, Jonathan Monk, Bridget Penney, Sarah Pierce, Elizabeth Price, Laure Prouvost, Clunie Reid, John Russell, Slavs and Tatars, NaoKo TakaHashi, Nick Thurston, Lynne Tillman, Mark Titchner, Alison Turnbull, Eva Weinmayr, and Neal White. 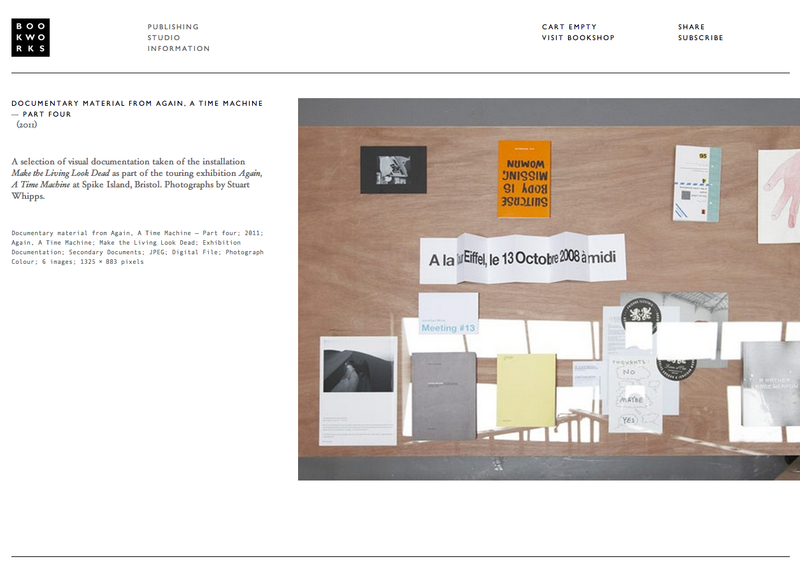 This archival installation is accompanied by screenings of Laure Prouvost’s film The Wanderer (The Storage), first commissioned and shown at Spike Island; A Poster Project, a series of ten appropriated and reprinted posters by Jonathan Monk, commissioned by Book Works and participating venues on the touring show; and shown alongside artists’ books, posters and limited edition prints published by Book Works, and a showreel of images, film, video and sound recordings compiled by Karen Di Franco and James Brook.